NOTE: If you are a fan of Person of Interest and haven’t seen Season 4 Episode 15 don’t read this because it is probably full of spoilers. It also contains wild speculation that probably has nothing whatsoever to do with the ongoing narrative of the show. 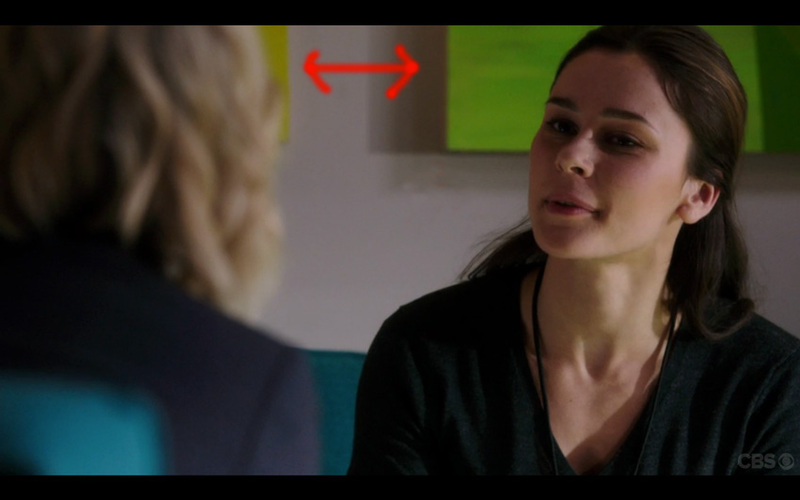 Though “Person of Interest” has been praised as “powerful political science fiction” by i09, I was watching it to see artwork by my spouse, Deborah Zlotsky. 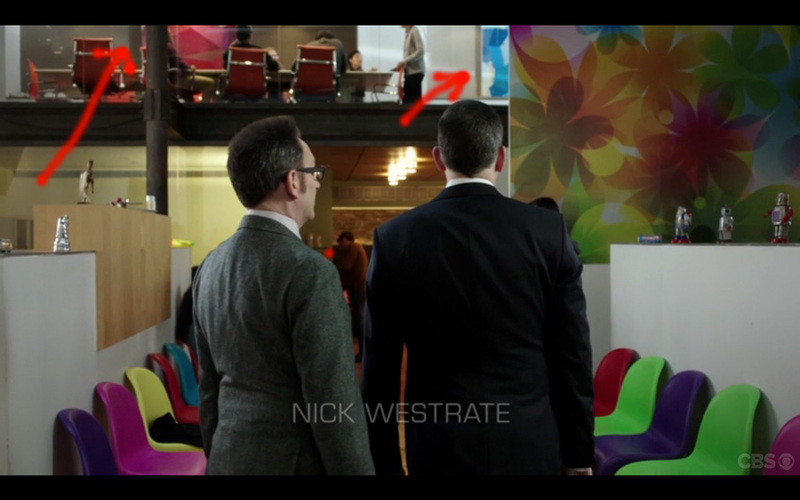 So in the show, her paintings were used as set decoration for a fictional software company in which much of the main plotline (about the programmer with a mysterious second life) is set. Though most viewers probably wouldn’t pay all that much attention to the artwork hanging in the background, it was what I was looking for — and the use of the work reveals a strange hidden narrative about one of the workers in the software company. Here’s Finch (Michael Emerson) and Reese (Jim Caviezel) in an early scene of the episode. Up there in back, in what looks like a conference room, are two paintings. The one the left is one called Everything Must Go; the one on the right is called Not so happy, yet happier. Yes, my wife’s paintings are abstract, colorful, and with geometric and biomorphic forms. If you compare what you can see of the paintings in this screengrab from the show, though, with how they are presented here on my wife’s website and here on my wife’s gallery’s website, you’ll see the paintings aren’t hung as intended. This painting, shown during the beginning of the show as the credits are still coming onscreen, is called Situational, three, and can be seen better here. The clear view of this painting was a surprise, because I imagined that the paintings would’ve been used as they are in the first image (way in the background), or how they are used in the one below (just behind a closeup of a character so as to be unrecognizable). Keep Situational, three in mind: It will appear again. Plot bit: The guy (played by Nick Westrate) is the founder of the software company; the woman (played by Heléne Yorke) is the CEO. OK, not much to see here by way of paintings. I show this because this is how I imagined the paintings would’ve been used. Some story plot here: This image shows the programmer with a secret life (played by Bella Dayne) being scolded by her boss (the CEO) for looking into something a co-worker told her to forget about. 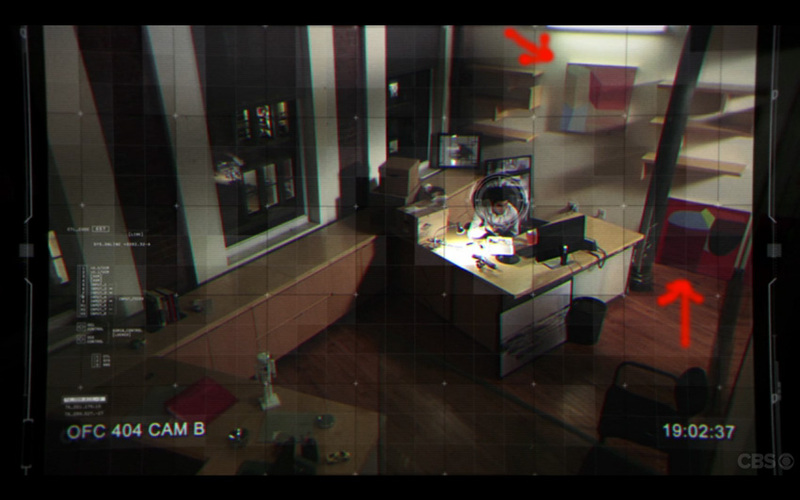 Another plot point: This is the new office of the co-worker who told the programmer to forget about something. He’s gotten a promotion. That means he’s moved out of the open office area (which was presided over by Situational, three) and into his own office. Note, moving into his own office space means he gets two of my wife’s paintings: The one hanging on the wall is called Situational, one, and a closer look at it is available here; the one one the floor is, yes, the previously seen Situational, three. 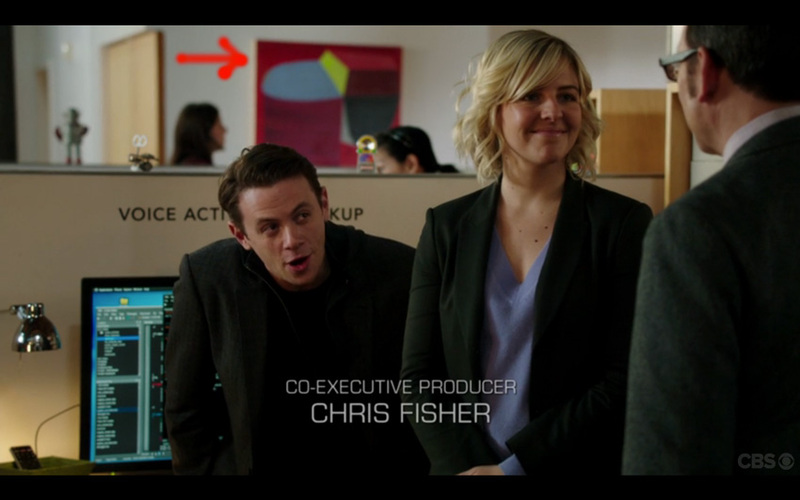 The show doesn’t explain why that painting, which was previously looking over the open-office area, gets to be used by one employee in his own office. 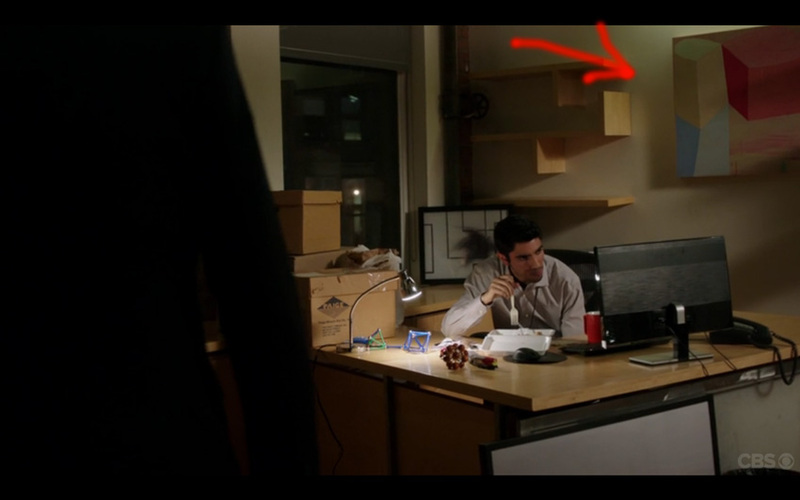 I can think of two reasons: The set directors wanted to imply a hidden narrative that this worker in addition to getting his own office also gets to have this cool work of art in his office, not only as decoration but also as a reminder of where he had come from. OR, maybe, the set directors didn’t think anyone would notice. Here’s a closer look at Situational, one and the actor Omar Maskati, in the role of the guy who got the promotion. This painting, too, will show up again later. This is my favorite screenshot. Here’s the programmer with the secret life (she’s an underground mixed-martial-arts fighter in her spare time to help pay for her sister’s chemotherapy, of course) in a fight with some bad guys in her CEO’s office. Yes, those are the paintings that were only visible as small rectangles of color in the earlier close-up photo of Bella Dayne. The painting on the left is Situational, two, and the painting on the right is Situational, four. Why is this fight happening? It has something to do with the software company’s founder being a bad guy with henchmen, unbeknownst to the programmer or even the CEO. But did the guy who got the promotion know about it? This image is from the final scene of the episode. Gone, now, is the founder (for being a bad guy), so the CEO is in the boardroom in charge of everything. Absent from the room is the guy who got the promotion. On the wall at right, however, is the painting Situational, one that had been in that guy’s new office. What’s happening here now? It seemed like the whole guy getting the promotion was just a red herring, and that the real bad guy was the founder. So what happened to the character that he’d lose the painting in his office? Even more so, this is a conference room, and yet in one of the first scenes there was a conference room that had two different paintings. If you look at this photo here and the first photo above, you’ll see that both conference rooms feature the same kind of red chairs. 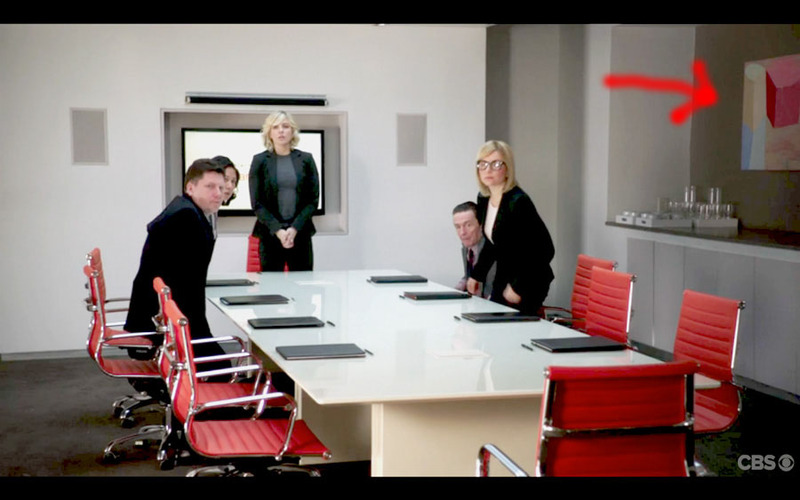 Could this be the SAME conference room?